The following is all information I covered before here, back in the Warlords of Draenor Beta, when tier 17 set bonuses were finalized. I've seen the subject come up again on the battle.net forums, and the MMO-Champion hunter forums, so I thought it might be worth going over again, as many of us are getting our 2 or 4 piece set bonuses in the live game. For those still not wanting to jump on the Survival bandwagon, I'll be covering the other two spec's set bonuses in my next two posts. (2) Set (Survival): When you cast Black Arrow, you automatically trigger Lock and Load. If you haven't had a chance to play with the Survival set bonuses yet, this one is surprisingly fun. Though not quite as powerful as BM's or MM's 2-piece, it provides an opportunity for planning out a little bit of burst damage. However, a question that's coming up repeatedly, is whether or not to delay Black Arrow until right after Explosive Shot goes on CD. When measured by Damage per Cast, and Damage per Focus, Black Arrow is at the top of our priority list, aside from Stampede or a Murder of Crows. So the first problem we'll be running into if we're delaying BA until right after ES, is over the course of a longer fight, we'll actually be lowering the number of BAs we can cast. So what we would need to see is if there's any way to make up for that lost damage through somehow increasing the number of Explosive Shots. 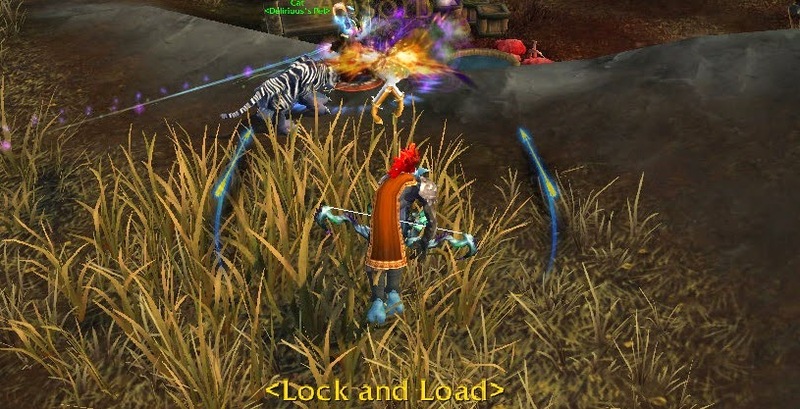 The trouble with that is, we're going to see a second Lock and Load before the end of the Black Arrow, as that was a mechanic they added when they took away LnL's ability to be proc'ed by traps. So before we look at anything, we know we're going to reset the CD on ES twice in the next 20 seconds. As with all things RNG, there isn't going to be one right answer, 100% of the time. Instead we'll just have to going with what has the higher percent chance of happening. In the case of the BA forced LnL, the only time we'll have a higher chance of getting more Explosive Shots from delaying BA is when BA and ES come off cooldown at the exact same time. That is to say, if both Explosive Shot and Black Arrow are available, we'll want to use Explosive Shot first. If Black Arrow is available but Explosive Shot is still on CD, then we'll want to use Black Arrow then the three Explosive Shots from LnL. For those not convinced, the best way I can think of to explain it is this: for every 24 seconds of Black Arrow, you're going to get 8 Explosive Shots (there are extreme counter-examples, where really bad or really good RNG could give you more, by way of an extra LnL proc, or less, if your second LnL overlaps your first; but both of those situations are rare enough that there's no sense in planning for them): three immediately following BA, three from your second LnL proc, and 2 from ES coming off CD. It doesn't matter when during the 24 seconds the second LnL happens, there will be 8 total ES. Because that's the case, delaying Black Arrow doesn't actually gain you more Explosive Shots, it just delays when the next cycle of 8 will begin. This opener leaves us with almost 0 focus left after that last Explosive Shot, and we're actually almost out of focus when we cast Black Arrow. Depending on our gear's haste rating, we might have to wait a small fraction of a second before casting the last Explosive Shot. Another option I considered, was if we pre-cast GT at -2 seconds, to begin. The trouble is, we would run out of focus before getting off all of our explosive shots if we used GT and Arcane at the beginning, so instead we'd have to push back our first Arcane until after the last ES. If we did that, we could either use arcane shot at the +6 sec mark, or a couple seconds later after casting a Focusing Shot, depending on whether TotH proc'ed or not. However, in this situation, we'd be delaying losing at least three ticks of Serpent Sting, and the damage from an Arcane Shot and 3 ticks of SS is about 33% more than just a Glaive Toss. Regardless of the specific opener you choose, the point of all that is, while having a guaranteed LnL proc in the pull might not be as impressive as two back-to-back Bestial Wraths, or that 45% increased crit damage at the end of Rapid Fire, it's still a significant boost to DPS, if you play it right. (4) Set (Survival): When you hit a target with Explosive Shot, your multistrike damage is increased by 50% for 3 sec. Out of four 17 - 20 minute training dummy kills, the least I ever had this buff up was 90%. On the other three fights, it's up-time was >99%, which at this point we're assuming is the intended mechanic of bonus. The only effect it's going to have on players is making Multistrike a bit more valuable as a stat on gear. Because the primary value of Multistrike for SV hunters is not in it's damage, but in proc'ing additional Serpent Sting ticks, this isn't going to affect our rotation at all, and will likely have very little affect on our gearing choices, either. While the SV set bonuses don't appear to be as big of a boost to our DPS as the other two specs' bonuses (both of the other specs' bonuses rely on augmenting a major cooldown, which SV is still lacking), SV still looks like it will be in the lead for single target damage, and will definitely be viable for most multi-target fights. Does the 2pc make lone wolf better than focusing shot? Thanks, very helpful post. After getting my 2-piece last week I immediately started to wonder how it would affect the opener, and also whether to delay BA during boss encounters. Another thing I was wondering: do you think the 2-piece affects the relative value of Steady Focus v. ToTH? That's actually a bit more complicated question than it seems. The simple answer is, you'll be casting less Arcane Shots with the 2-piece, because you'll be spending an extra 12.5% of your time casting Explosive Shots, which would of course make TotH less valuable. However, most hunters are finding that with the 2-piece, Lone Wolf is a better DPS talent to take than Focusing Shot, because of both the buff to ES, and because we're less focus starved. Without a pet, you lose half the value of Steady Focus (well, maybe not half, but some of the value), and it becomes a more difficult talent, in that you have to plan much further ahead to use double cobra shots instead of a single Focusing Shot, and risk delaying more important abilities. In the end, it looks like the two talents (SF and TotH) are going to be close enough that individual play style will determine which is a greater DPS increase. I'm only getting about a .5% difference in the sims, going SF/FS vs TotH/LW. So basically you can use whichever you enjoy more. That makes sense, thanks. I think the practical tie-breaker is likely the rotational flexibility that TotH continues to provide over Steady Shot. Although I personally don't mind pairing Cobras if it's simmed well ahead, it doesn't make it any less annoying, and you always kind of feel like you're missing out by doing it. The only tangible benefit I saw from SF earlier in the xpac was that it made focus-pooling easier for ensuring Barrage could be cast on cooldown in AOE situations. I haven't had enough practice with it, but I'm also now musing whether it will be a shade more difficult to squeeze in all TotH procs before they expire while still trying to maximize LnL procs from the 2-piece. This goes back to one of your other posts about the importance of ensuring the TotH charges don't expire. Finally, have you done your own math on the Lone Wolf v. Focusing Shot question yet, or are you just hearing of anecdotal comparisons to this point? So I've only been looking at simulations with it for LW vs. FS. I suppose I could take a look at other people's logs to gather more data, but not having their exact gear shown or knowing why/how they make rotational decisions makes it hard to verify things. Anyhow, hopefully my luck will improve this raid reset. Anyhow, SimC is definitely favoring LW for single target, but not by much. Interesting. Thanks man and good luck picking up the gear this week. Keep up the great work with these posts, I can only imagine how time consuming they are. Cheers.